"This three-story structure was built at the corner of Avon and Main Streets in 1895 for John Flanley, a prominent furniture dealer and real estate owner. The building, 'one of the largest and best blocks in town,' was built in the Italian Renaissance style and was originally trapezoidal in shape to fit on the lot. The Souhegan Lodge No. 38, Independent Order of Odd Fellows purchased the building on February 9, 1918 from Flanley's family, with a dedication held on June 25, 1918. At the time, the land and building were assessed at $20,000. From the date of purchase until the dedication, the Odd Fellows made extensive changes and improvements to the third floor to 'make the hall and anterooms suitable for fraternal purposes.' The second floor remained in use as office space, while the first floor was occupied by stores. The Odd Fellow's purchase of the building was the culmination of several years of plans 'extending over a period of years to acquire larger and more modern quarters.' Ten years earlier, the organization bought the 'old John Henry Eaton estate on Albion Street, next to the former Atherton grocery', but later decided it was unsuited to their uses. The lodge was instituted in 1844, with objectives of good fellowship and benefits to members and their families. The Odd Fellows building suffered extensive damage in a January 24, 1997 fire. It was subsequently purchased, rebuilt and restored by The Savings Bank." -- Text from calendar by Jayne M. D'Onofrio. Photo courtesy of the Wakefield Item Company. 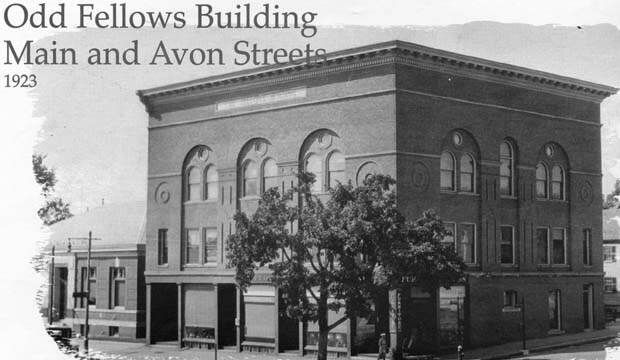 “Odd Fellows Building, Main and Avon Streets, 1923,” NOBLE Digital Heritage, accessed April 20, 2019, https://digitalheritage.noblenet.org/noble/items/show/7039.